Today I have a little story to share, something that happened to me and left me a little dazzled and speechless. Something that not only suggests that there is someone up there who rolls the dice, but also that life’s events are all mysteriously and inexplicably connected and intertwined. Weeks ago I found a great carpenter to build a cupboard for one of the rooms in our new home. He had built few pieces for me in the past, and I knew that he was extremely talented and wasn’t going to charge me an arm and leg for that cupboard. So I told him exactly what I wanted, the little details I fancied, the knobs, the colours, the partitions, and he agreed. The price was perfect, the design was fabulous and I was over the moon that finally my clothes will have a safe and stylish home to harbour them. He promised to finish the piece of art in 2 weeks, and I knew he would do his best to honor his word, as he always did. 4 weeks later, I still haven’t heard from the man, I called, texted, called again, but no answer! I had given him half of the price we agreed on, and now it seemed like I just got duped. I was more pissed about my homeless clothes, that now are destined to live all over the place, more than anything else. My dreams of having my fabulous white closet have disappeared. Oooh and I also had to start thinking of ways to explain to my dear husband how 200BD has simply vanished!!!! Long story short, the carpenter was a very decent man, he was in some kind of trouble, he brought the down payment back, and told me that he couldn’t build my closet. Obviously all hopes of having what I have spent days dreaming of have evaporated! I gave myself time to mourn, but I moved on, and was convinced that I would just have to live either without a closet, or with a less than OK one, that I am probably going to get from a cheap furniture store. Weeks have past, and one day while browsing on Facebook, I came across a very talented couple who collect, make, paint, and restore furniture, to sell. They create beauty at its finest. The treasures I have seen on their Facebook page were incredibly stunning. 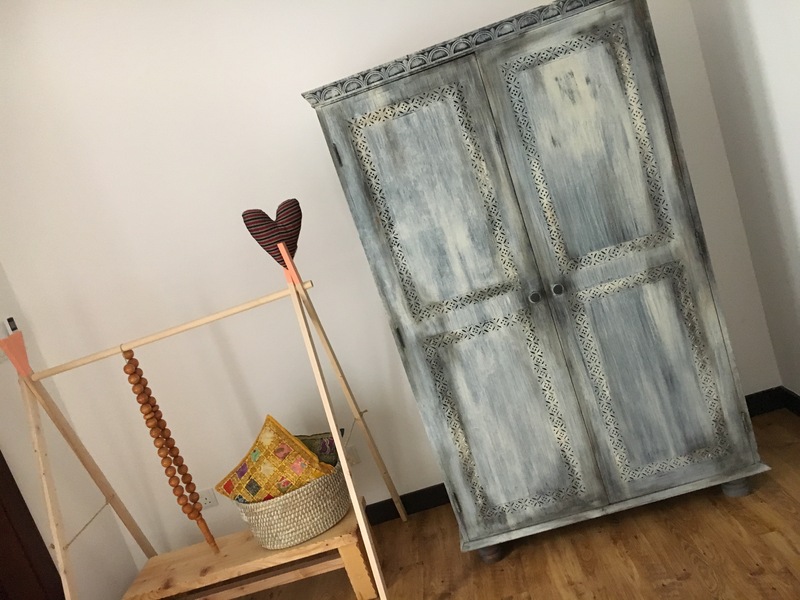 Among these treasures was an old Bahraini cupboard, that they restored and painted, and gave it a taste of sophistication while keeping its authenticity. Without thinking twice, I knew that THAT was MY cupboard and I had to get it. 2 days later the marvelous piece of art, stood tall in my room! That night and when I thought about it, I realized how sad I was over that whole carpenter story and how he couldn’t make the cupboard I dreamed of. I thought I would never get what I wanted, I thought what has happened was incredibly upsetting and disappointing. Little did I know, that the perfect cupboard was somewhere out there, patiently waiting for me to come and make it mine. The cupboard story is very similar to many many other stories that happen in real life, where we get so overwhelmed and upset when things don’t go the way we want them to. What we don’t know is that somewhere, the perfect thing is waiting. Waiting for us to make peace with ourselves and be ready to invite that perfect thing in our lives. What can seem to be unfair, upsetting, bad, can sometimes be not only good, but great and perfect for us. As the holy Quran says: “Perhaps you hate a thing and it is good for you” ( وعسى ان تكرهو شيئا و هو خير لكم) From Surat Al Baqarah.